Look at is aluminum pergola that we built that includes decorative concrete. This particular pergola white wood embossing and decorative concrete give this cover a sophisticated design perfect for entertaining! The benefits of a pergola are that it gives you plenty of shade and allows air to circulate freely through the slats. 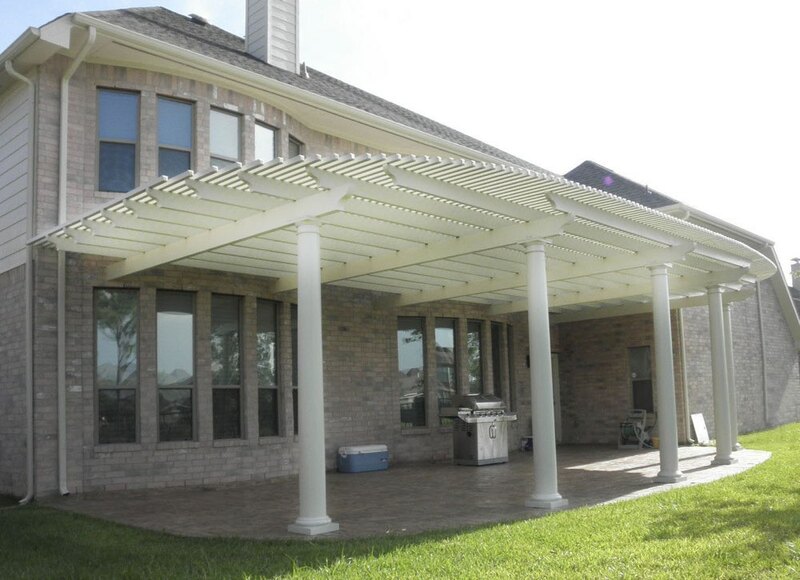 You may decide to choose an aluminum pergola rather than a wood one because aluminum requires less maintenance, it will never fade, and will never be destroyed by insects. The aluminum can be cleaned with a water hose or a pressure washer without fear of causing damage. One of the beautiful things about our aluminum arbors and pergola is that our pergolas have wood grain embossing that mimics real wood. So you get the look of a cedar without all the maintenance and hassle.